You are currently browsing the tag archive for the ‘I heart flowers’ tag. 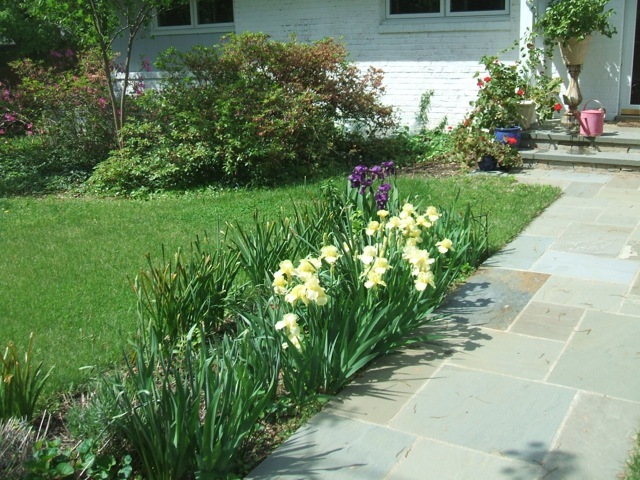 Today’s post features pretty flower photos from some of my readers who love to garden but don’t have their own blogs – it’s time for the May 2014 Garden Nonbloggers’ Bloom Day. Yay for flowers! Let’s see what you have blooming. 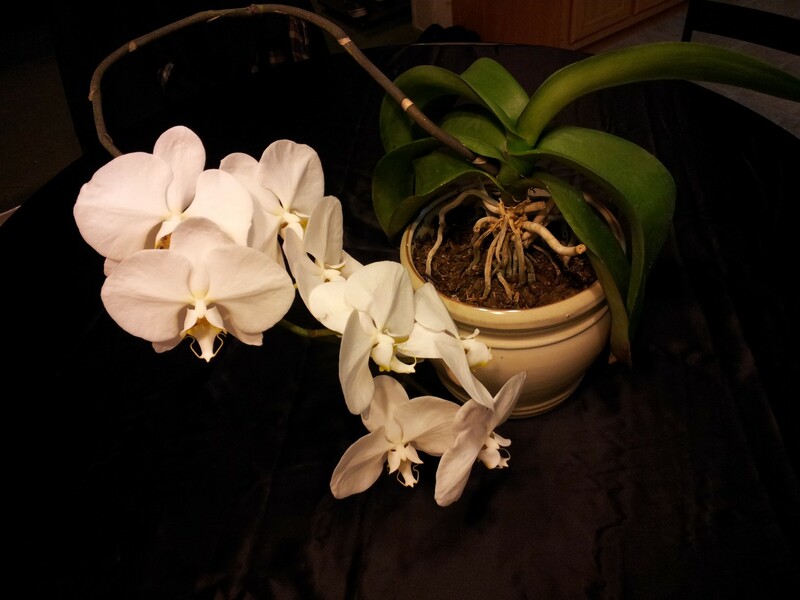 Says Jennifer, “I’m so very proud of my orchids, and how happy they seem to be. I just had to share. There are four of them, I’ve had them now for four years. And they just keep blooming their little hearts out for me and getting bigger and bigger. I live in a high altitude desert and I’ve had more than one person try to tell me that orchids just can’t survive here. Hah! They recently got repotted into these larger (and heavier!) ceramic and terra cotta pots. And it’s looking like it’ll take them a year, maybe two to outgrow THOSE. Monsters! Wow! Those are super cool, Jennifer. 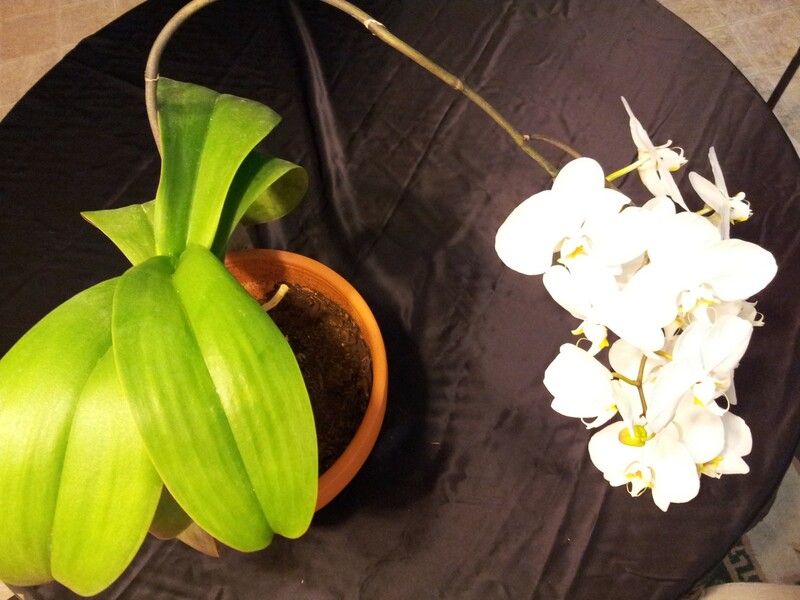 You’ve got a natural green thumb when it comes to Orchids. You are in the minority – keep up the good work! Up next, photos from the ever-awesome Ginny Burton, of Burton Optician in DC. Says Ginny, “Finally winter seems to have disappeared and the warming sun has brought out the flowers. The clump of small light yellow irises I call “NotBeverlySills” because what bloomed was clearly not the Beverly Sills that was described as “flamingo pink.” Still, it’s a nice flower and bloomed well. On the other side of the driveway is “Red at Night.” My dear friend Rachel gave me some several years ago. Then last year my yoga teacher, Karin, gave me a bunch of rhizomes that had never bloomed for her because her yard is so shady. They turned out to be “Red at Night” also. 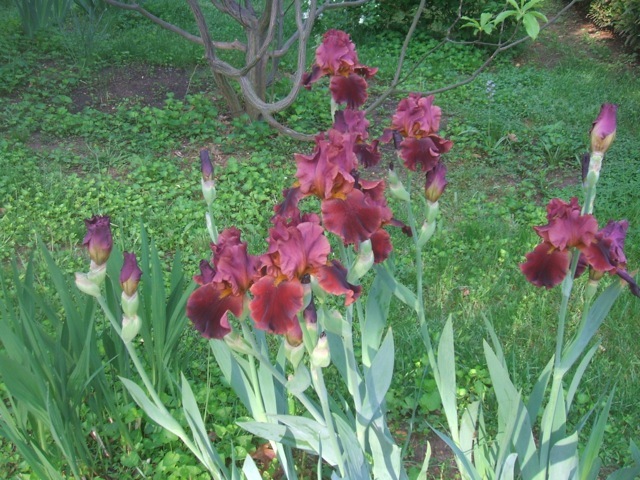 What’s up with these crazy dwarf irises? The foliage is nearly a foot tall, but the flowers are right at the base. Did I do something wrong, or is this how they’re supposed to grow? I got the bulbs on sale at a hardware store, and part of the label was missing. 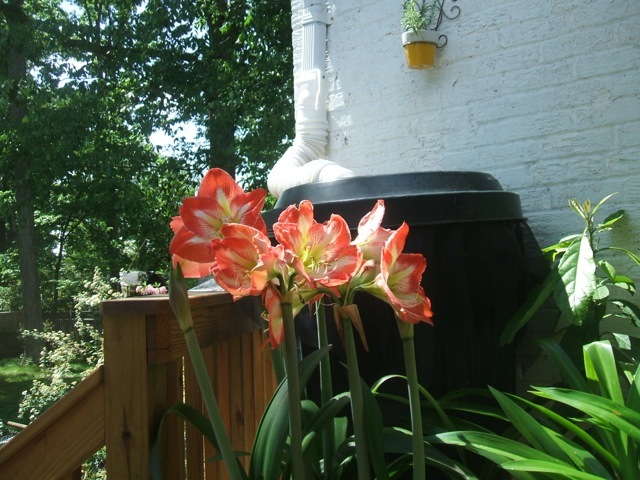 Here are my amaryllis, spider lily, and avocado tree trying to hide one of my rain barrels from the neighbors’ view. Thanks again for hosting and I hope some of your nonblogging fans will post pictures of their gardens, too. Thank you, Ginny! I love seeing pictures from your place – it’s always so green and lush, and you have such pretty flowers blooming. You do make me miss the East Coast, but in a good way. Nice work! 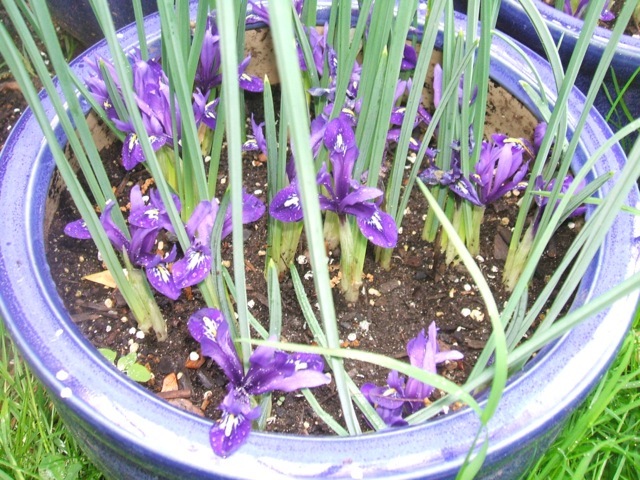 I have no idea why those dwarf Irises look like that, but I suspect that’s why they were on sale. Readers? Do you have any explanations for Ginny’s silly plants? Leave a comment for her, please. Up next, we have photos from Nancy Popp Mumpton of Phoenix. 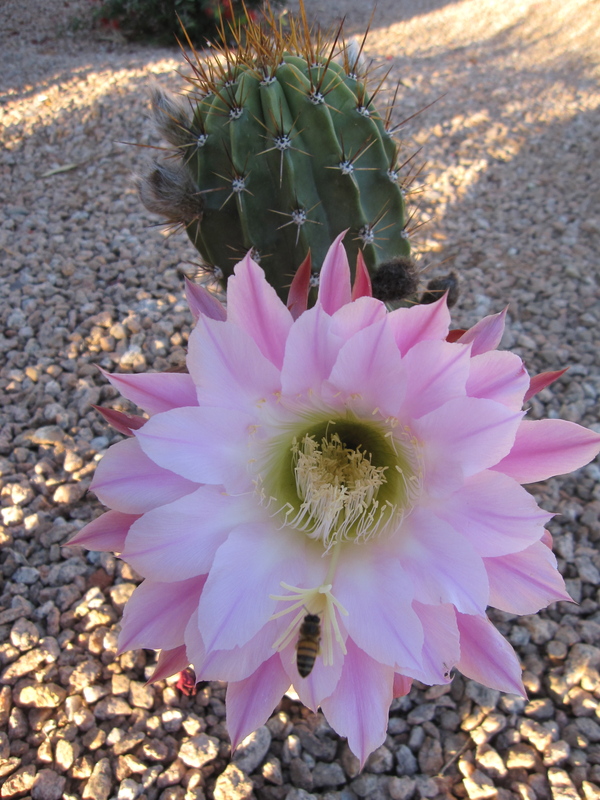 Says Nancy, “A few photos of some of my blooming cactus you can show when the time is right! There are so many blooming now it is hard to choose! Those are spectacular, Nancy! Holy moly! That Dutchman’s Gold has so many yellow blooms that you can’t even see the plant! That’s incredible. What a gorgeous show from the thorny crowd. Thank you for sharing them with us. That does it for our photo gallery for May. We’ll do it again next month. If you have pretty flowers blooming at your house, but don’t have a blog, take photos and send them to me! I’ll post them after the next Garden Bloggers’ Bloom Day. She’s a little early…I usually don’t see blooms until December or January. But I’m not complaining, I cannot get enough of that heavenly scent! And the blooms mean I’ll have limes growing in the house sooner rather than later, so that’s cool, too. It keeps getting longer and longer! The stem grew from a couple of inches of blooms to over a foot of them. I didn’t expect that, so I’m very impressed! Yet another reason why I love succulents. I have the most cheerful front yard on the block. Thanks Cosmos! The backdoor container garden’s coming along! Mostly, everything’s been growing great. There are tons of tomatoes (minus all the cherry ones that I’ve been picking off and eating the moment they are ready), the peppers are growing, there are radishes, beets, oregano, basil, strawberries (well, a couple of them anyway) and garlic. All the flowers make me super happy. But there are a few plants that aren’t doing as well. Remember those onions that were blooming? Well, I finally pulled them last week and was shocked to see the bottoms were wet and starting to rot. What? In an Albuquerque summer, I overwatered a container that has drainage holes??? That didn’t make sense. Sure, there’s mulch to retain moisture and it was obviously doing its job. But really? All the planters are in full sun all day! Besides, I’m the plant lady! Overwatering is supposed to be a rookie mistake! Clearly, those onions must be liars. Yes. That’s the only logical conclusion. I’m perfect and the onions are lying. Stupid onions. I never liked them much anyway. Ok, ok, I’ll admit I’m lying – I love onions. They’re decent and honest vegetables. I musta goofed somewhere along the way. Instead of dwelling on my mistake and beating myself up (what’s done is done! ), I decided move forward and vowed to slow waaaay down on watering any of the containers. Since that decision, it’s rained every day. The excess moisture may also explain why the Bougainvillea lost all its colorful bracts (they’re making a wonderful comeback already) and why the Osteospermum stopped flowering a couple of weeks ago. I’m really not perfect? That is SHOCKING news. I guess I’m left with no choice but to accept that I’m a mere mortal with flaws like everyone else. Sigh. Haha, I’m teasing, of course. I’ve known for ages that I’m not perfect and that I’m going to make mistakes. No one likes to admit their mistakes – especially not on a public forum like a blog – but I personally am not attached the idea of being right, so it’s ok. It’s not the first time and it won’t be the last. I am beside myself to see what these little Echeveria flowers are going to look like in a day or two (finally, after weeks of anticipation). Thanks to our hostess Carol over at May Dreams Gardens for suggesting we post photos of what’s blooming on the 15th of each month. Hope you have a great weekend, I’ll be back Monday. For the last couple of weeks, I’ve noticed a few clumps of fall-bloooming Mexican Evening Primrose (Oenothera) as I drove around Albuquerque. They are nothing if they are not hardy little boogers. I love the adorable pink blossoms, but I can see why people get so mad about how much they spread. If you want a nice neat little flower bed plant, this is not the one for you. 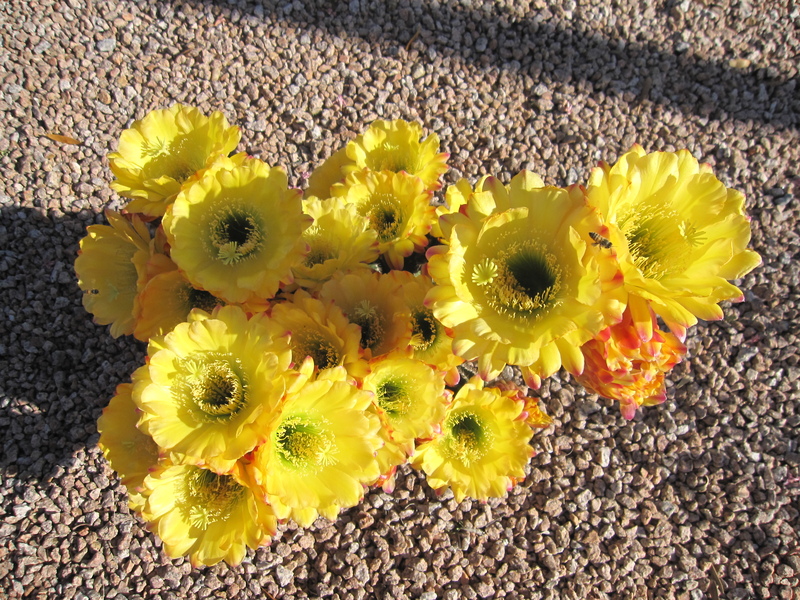 They absolutely thrive in crappy soil, which we have an abundance of in New Mexico. In my yard, they have not been invasive and I think that’s because once they are done blooming in the spring, I don’t irrigate that part of the yard again until next spring. 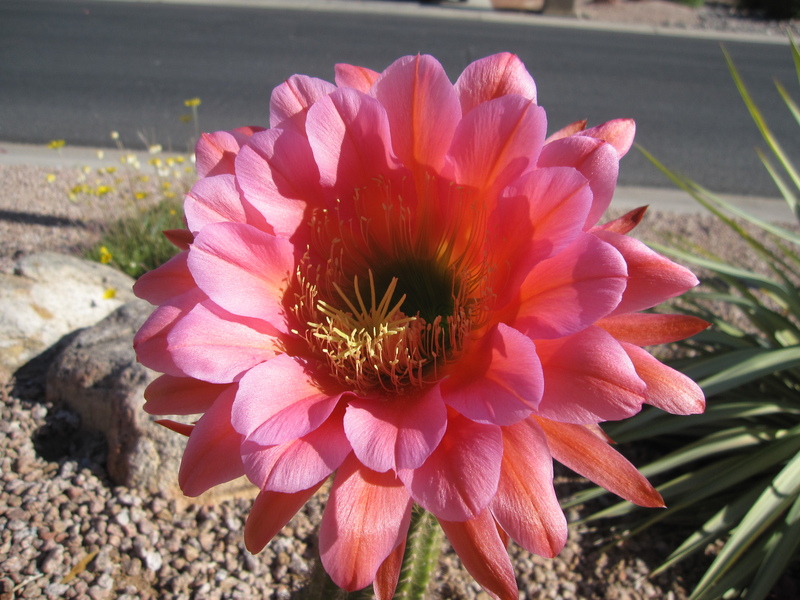 A fall rebloom is a testament to the monsoon rains rather than my attention to them. It’s hard to believe any plant becoming invasive here with our wild weather swings. But if the Mexican Evening Primrose tried to conquer my yard, I believe the Morning Glories would knock them down. Aaaahhh, I love me some pretty flowers! It’s looked like that for weeks now. 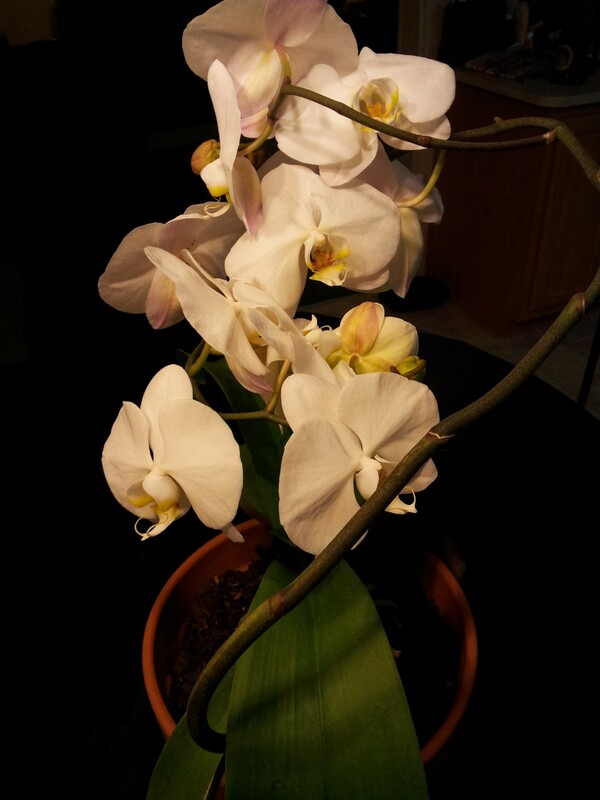 Yay for flowers indoors in winter! Thanks to Carol at May Dreams Gardens for suggesting we post photos of what’s blooming around the 15thish of each month. 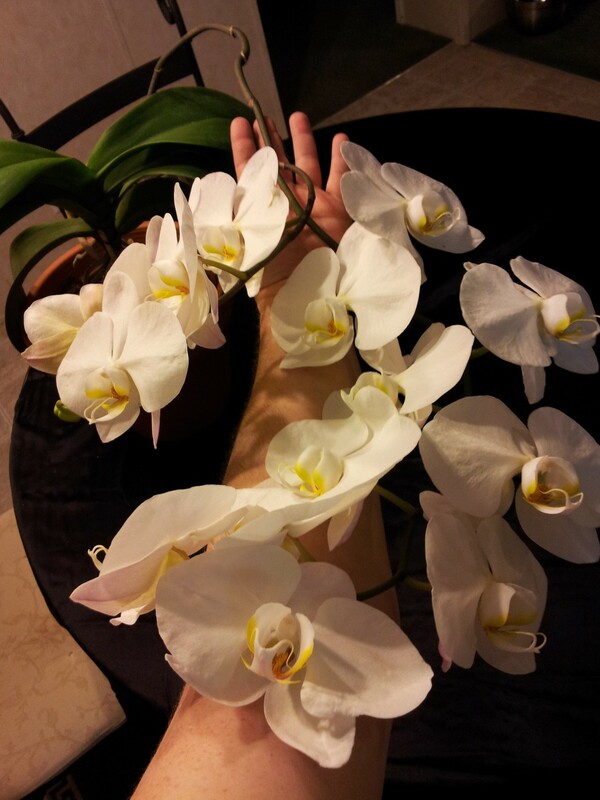 So, what’s blooming in your house? Ahh, December! When my outdoor gardens lay frozen and quiet, my indoor garden begins to come alive. Hi lemonbunnies, and welcome back to the Good To Grow site. Today I have photos of pretty blooms, something we do on the 15thish of each month because I’m a complete sucker for flowers. A big splash of red, and now Crissy is about to rebloom with pink blooms. They show no signs of slowing down. An unparalleled enthusiasm for life! Every winter when she blooms, I mourn that the Internet cannot yet transmit scents. Where are my brainiacs? I’m sure Ellie’s swelling with pride! I’ll be back manana with an all-new panel of Experts. The Experts will then be off for the next few Fridays for the holidays (I’ll still be here with puzzlers), so I hope you tune in tomorrow. It promises to be great fun! Yay! It’s that time of the month again when Carol at May Dreams Gardens encourages us to share photos of what’s blooming in and around the house. She doesn’t have to ask me twice – I loooooves me some flower photos! I’d like my regular readers to know that I haven’t repeated a single Cosmos photo in the last few months. You’re welcome for me not sharing all eight thousand that I shot. Man, I could look at Cosmos photos all day, couldn’t you? Silly little blooms! 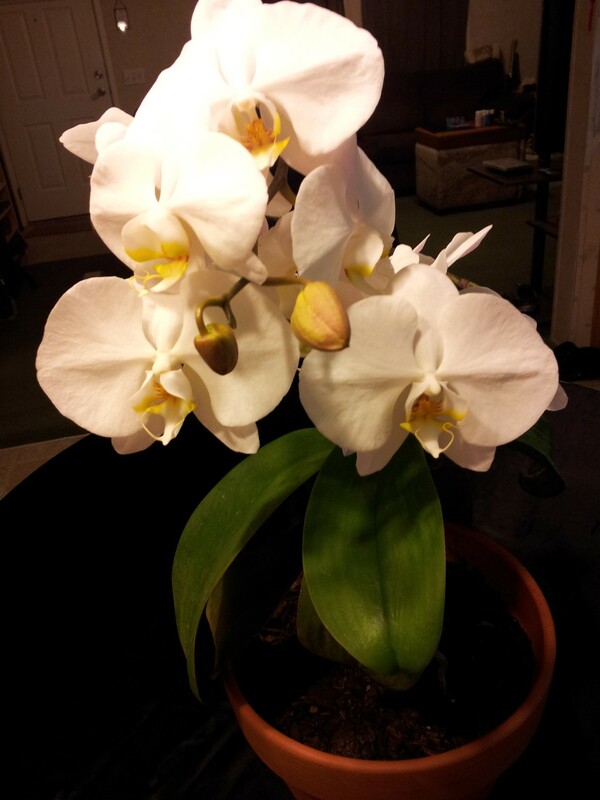 She makes me really happy to be an indoor gardener, because when plants bloom in the house, it’s…well…magical. How would I get through dreary winters without my houseplants to cheer me until spring? Her blooms are decidedly pink, which isn’t as good as purple, but it’s still pretty awesome. Hey, normally I publish Monday through Saturday, but check back tomorrow because I’m going to do a special post about a cool new book giveaway from Timber Press. See ya manana. A few weeks ago, I swapped out the leaf hopper-chomped Petunias by my back door with pretty Pansies. I looooove me some Pansies. Yeah, I think it’s pretty obvious how much I love them. They’re so cheerful, how can I resist? It was raining in the morning when the sun peeked over the Sandia Mountains, so there was a morning rainbow. Which I love almost as much as flowers. Yet more Cosmos flower photos, because I’m completely charmed by them right now. Oh my, I might swoon, they’re so beautiful!